Why Business Owners (Entrepreneurs) Should Learn to Code? 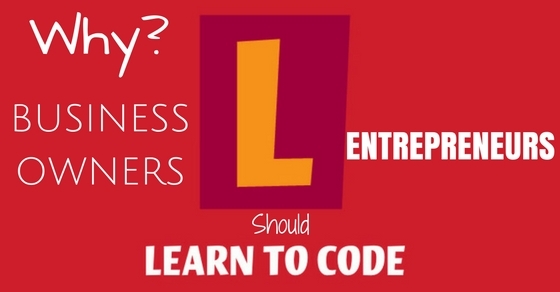 Learning to code is not only important for a programmer but also to an entrepreneur. In everyday life people use one or the other form of coding. This basic knowledge of coding will help in gathering knowledge in technology. But when a person is strong in fundamentals of programming language, he/she can shine at all levels. Business owners should develop a mentality that “I like to code” instead of “I want to code”. As everyone started using computers, if one has to become outstanding then he/she must be able to execute programs. In the business world, owner should be aware of every minute happening, even if he/she is not directly involved. Learning to code is essential nowadays. It doesn’t mean that the owner has to completely work on it. Atleast he/she should be able to correct it when the employees go wrong. Technology is used in every business process. Basic level of coding may not make a person outstanding. Here are some reasons to become a good programmer. Instead of taking effort to hire a developer, the business owner can spend time in coding. This will help in reducing the overall cost spent. Sometimes the server may hang due to certain coding, but the owner will have an opportunity to overcome it. Learning to code and gathering knowledge about the present technology will help people to code effectively. If the owner has to take the business to a new environment then he/she must be aware of the new technology that can be used in business development. Understanding the language of technology will help in developing the coding skills. Another best reason for learning to code is it will help in hiring a right candidate. Coding becomes a part of technology and also a part of operations. Even to manage the systems, the person should be aware of programming, because if the system hangs due to certain bug then he/she must have the knowledge about troubleshooting techniques. Thus there are many cognitive benefits in learning to code. If the owner is from a budget background, then he/she will be financial minded. Business people who are money minded can save their money as well as time, if they are good programmers. Anything can be done at anytime as the work is done by them. Gradually, if the person can explore a new technology by coding then he/she can save even more. Business owners will be capable of combining the ideas about business with that of coding. Some businessmen have reported that they are able to understand the process if their ideas are implemented by combining their ideas with that of the coding. Coding will help in sharpening the problem solving techniques. This ability will help in handling technical issues and to think out of the bucket. It makes one to think better and also widens the knowledge. Businessmen can adapt to the new technologies easily. Way of thinking also varies while compared to others. This makes people to sharpen their knowledge. One can gain rational and logical framework that enhances high level of problem solving techniques. Writing detailed codes in a simple manner will help to develop programming brain. Managerial skills and the coding knowledge will help business owners to run the business by implementing innovative ideas. Even if the business does not have new prototypes then the developer can create new prototypes for the business. These prototypes allows to code explore new ideas. These prototypes sometimes can be websites, URLs that will help in getting the ideas directly from the customers. Without harming one can create their own business as it will keep the product out of risk. General fact is that as the company grows the task will be assigned more. They can be assigned to the outsourcing companies or to certain developers. So, the timeline can be estimated by the owners if he/she is aware of coding. Incase, if the owner is unaware of coding then he/she will miss good opportunities. When the startup grows owner has to be conscious of all the products that are available in the market and the system behind it. To design new web application, one must know to manage the products. It is a known fact that web application is designed using programming languages. By understanding about the capital and the time that has to be spent, owner can build new projects. This understanding will modulate the time taken to design the website. Understanding the digital struggles and frustrations, owners and business people should aim at productivity. Once the growth in the business becomes enormous then it is obvious that the owner will avail to start a new career. These career opportunities will become a nightmare if the owner does not have knowledge about coding. It includes segmenting of work, networking etc. So it is advisable to learn coding within certain period. If the person gives up one plan then he/she should always have another option. All most all the businessmen have faster analyzing capability. The results will be analyzed as the person goes deeper into the field. One can solve the problems that are involved either in work or in personal life. As the capability to think increases the owner will analyze the issues easily and will be capable of making decisions. It is very difficult to make both the ends meet. As there will be office politics everywhere around the office, owner has to sustain all the employees. Owner can have better understanding about the language if they communicate with the developers. A person who doesn’t have proper guidance will struggle a lot to learn things, but if there is proper communication with the people who are capable of doings things then the work can be completed easily. Owner must ensure that there is proper communication between the team members. If an owner is unable to entertain or adapt to new technology then he/she may not have good hope about the business. Keen understanding and appreciation of the technology will help the person grow in business. Latest technologies have to be implemented as the innovation is designed with the help of consciousness. Ideas and possibilities that disrupt the industries have to be replaced with that of the new technologies. Business owners are always focused on the improvement and the growth of the organization. When the owner is well equipped with coding skills then he/she will get a clear and big picture of each project. Plans that are opted for business are well equipped and the company’s interface will be for the growth of organization. Owner must be a potential hirer, programmer, analyst, investor etc. No matter which language it is to satisfy the responsibilities, programming knowledge is most important in terms of business. Coding helps people to perform the work in the way they want and also there are so many fields that prove programming and coding is more important in the business sectors. Most of the business owners sustain their business with less amount of coding knowledge, but if the business has to take a big leap then coding skills plays a vital role. In the present world, there is no life without coding for the professionals. Apart from this constant endeavor is made as there is sense of achievement and the success. This makes them energized and also new ideas that are implemented sometimes become a benchmark of certain companies. Ability to speak in different language with the customers and understanding the deadlines of the project helps in the growth of the company. Coding is the most advantageous and the exciting field of today’s world. It offers wide range of benefits to the professionals. Coding has become a part and parcel of professionals. Being applicable and well suited for the business activities, owners must gather knowledge about programming. Coding helps the business owners to create new modules. These modules that the computer works with can be promoted to the other requirements. If a project is implemented by an organization then the owners of other organization may approach which will earn profit to the company. Average range of profit can be achieved by all the companies but innovative ideas will help in earning profitable income. Programming field is one of the developing one in the area of computers. This helps in growing in relevant technology. Training and development helps in updation of work based subjects or the programming languages. If the business owner knows coding then he/she can motivate the employees to attain the goal. Even training can be given if it is required. If a problem has to be solved then the person should be good at analyzing issues. Here the degree that the owner has passed plays a vital role, as he/she can expose the knowledge that is learnt in degree. Businessmen have to implement new ideas that may provide greater benefits to the organization. Problem solving techniques will be undertaken by the programmers easily. Business owners can develop a domain that is related to the organization. Undoubtedly as we all know developing a website requires little coding experience. Owners can create new websites when they are good at coding. On the other hand developing and maintaining the website requires adequate knowledge about the languages such as HTML and CSS. How to Learn Coding as a Business Owner? This process of selection includes programming language that is important for the business and this language should be a trend in market. According to the requirement of the client, businessmen should keep them updated. Starting with simpler language will help to learn easily. This includes the concepts that are used in the language. As these concepts are the basics of a new language, individual has to be strong in it. Installing the necessary software and practicing in it will help in creative ideas. Initially using an interpreter that executes the programs without compiling is advisable. One can start executing small programs. Here they should be focused on syntax and the concepts. Making changes and analyzing the output will also help in learning faster. One should keep trying with different examples. Fixing the bugs and correcting them will help the individual to become a tester. One should keep in mind that to become a tester he/she should be a good programmer. Coding daily will help the person to master the programming language. Like other skills the business owner can become proficient in coding too. Spending atleast two hours per day will develop confidence. Practicing the programs in tutorials, programming forum will enhance various ideas. Reading the coding of others also will trigger many methods of coding. There are many universities and online websites that help people to learn coding easily. Applying the skills in various programs will make the person to conquer the language. Hence business owners should learn coding to correlate the ideas and the projects. Ability to code will help people to implement various ideas and to think out of bucket. Promoting the business from one level to next can be done. Hiring Solutions – How to Recruit Employees Effectively? How to Become an Employer of Choice?